The Dove Canyon Tour is a full-on day out involving an abseil into the canyon, followed by six waterfall jumps and slides and a number of other obstacles. No experience is necessary – just a reasonable level of fitness and ability to swim. The Lost World Canyon is a much easier and shorter option, great for families and available to participants aged at least eight. This one is all about getting up close and personal with nature. Tours depart from the Cradle Mountain Visitor Centre. Cradle Mountain is around 90 minutes drive (88 kilometres) from Devonport or 2 hours 15 minutes (153km) from Launceston. An action packed day in an amazing place. 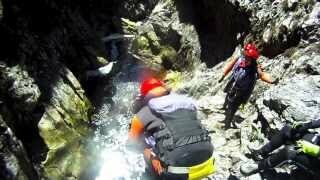 After abseiling into the canyon, we soon come to Freestyle Falls and jump the seven metres into the deep pool below. We continue through the canyon, encountering five more waterfalls. A highlight is the Laundry Shoot - a massive natural water-slide in the heart of the canyon. Finding yourself in a large cave-like area, you bob towards the light at the end of the tunnel that seems to be sucking you toward it with more force the closer you get. We won't spoil the surprise of what happens next...but it's damn cool. This amazing part of Tasmania's Wilderness World Heritage Area can be seen by no way other than canyoning. There's plenty of time to soak in the grandeur of the place in between the heart-pumping waterfalls. Dove Canyon is our most action packed adventure, but participants do not need previous experience - just a sense of adventure and ability to swim. Float and walk through a beautiful section of river and see the world from the point of view of a platypus. The Lost World Canyon offers a truly unique way to experience Tasmania’s Wilderness World Heritage Area. This tour is all about getting up close and personal with nature. Available to participants aged eight and up, it is not aimed at the adrenaline junkie, but some jump rocks up to three metres high and other challenges spice things up. Some of the highlights include seeing 1000 year old pencil pine trees and hearing the story of James 'Philosopher' Smith - the legendary first canyoner at Cradle Mountain.